When affordances of object prevent people to act. 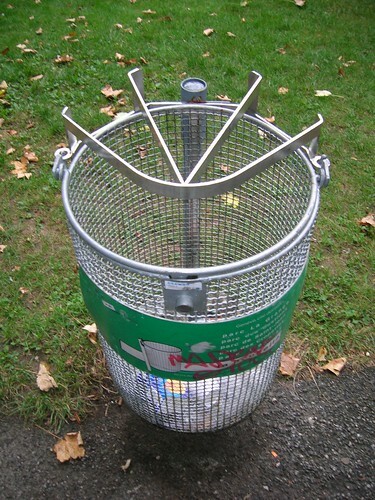 In this case, this garbage in Geneva does not allow people to trash big objects (bombs? private trash?). In a sense, this is about delegating to non-humans a certain function. Update: look at the two other examples that are from France below: on the left, a simple piece of cardboard, on the right, a lucid/translucent trash bag. Both are interesting examples of forcing a transparent behavior. There are also rigid plastic garbage that are transparent (no picture though), all of those appeared in the VIGIPIRATE frenziness in the 90s. This led to lots of curious behavior that I don't have time to address here (low number of trash = garbage everywhere around the one that people found...). No to mention the different way to cover/close the public trash to avoid them being filled (!) with bombs.